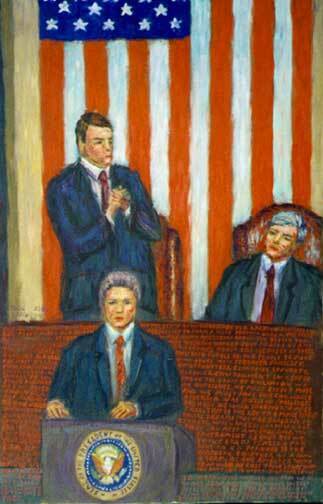 "State of the Union, 1996"
President Clinton ran for office on a pledge to bring America together so that we could work toward common goals while discussing and trying to work out our differences. By January, 1996, the President had stood up to the Republican Congress and had begun to re-assert his own programs and priorities. He built his re-election campaign on the theme of unity, responsibility, and compassion. This became the bridge to the 21st Century, upon which he swept to re-election.